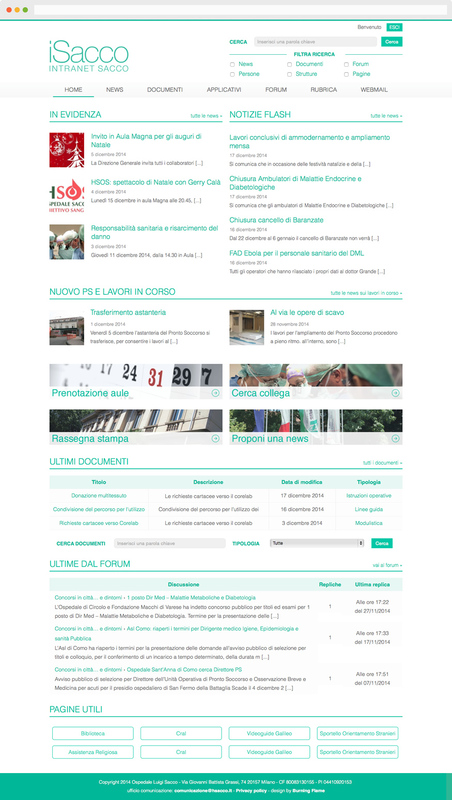 iSacco is the new intranet portal of the hospital and university Luigi Sacco of Milan, one of the most important health facilities in Lombardy. The platform provides several services to employees, accessible through a graphical interface carefully designed. All sections have been developed by Burning Flame: news management, company documentation management, applications management, discussion forums, conference rooms and classrooms reservation, employees phonebook and structures address book directory. The responsive layout allows an optimal experience on smartphones, tablets and desktop computers, ensuring full accessibility to the entire platform on the move, which is crucial for use in the medical field. The web platform was developed through HTML5, PHP, CSS and jQuery technologies, using WordPress as CMS engine, configured and customized to suit particular needs. The employees phonebook update is guaranteed by the automatic synchronization with Active Directory servers of the hospital. The management and optimization of the production server performed complete the development process of the portal.